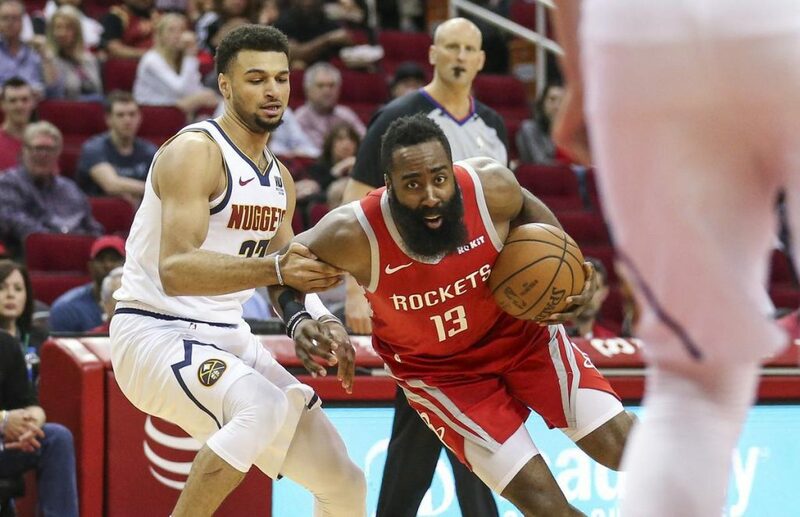 The Houston Rockets will need a little help if they are going to overtake the Denver Nuggets for the No. 2 seed in the Western Conference. However, with a game against the Nuggets Thursday night in Houston, they had a chance to make up some ground—and they did. They didn’t look so good in the first, but once the defense got dialed in during the second quarter, things took a turn for the better. After the first, the Nuggets were up by three, 25-22, but the deficit was short-lived. A quick 8-2 spurt to start the second quarter put Houston ahead 30-27 just over a minute into the second. By the end of the half, the Rockets led 62-44. Denver got within 13 points during the third. However, by the time the fourth rolled around they were down by 22 points, 87-65. The Nuggets never really threatened in the fourth, either. Houston went on to win by 27, 112-85. As usual, James Harden led the way for the Rockets with 38 point, six rebounds, and six assists followed by Eric Gordon with 18 points. Clint Capela chipped in a double-double with 17 points and 15 rebounds. Austin Rivers led the way off the bench with 15 points. Jamal Murray led the way for the Nuggets with Jamal Murray with 20-points followed by Niola Jokic with 16. Monte Morris led the way off the bench with 16 points. After a disastrous start to the season defensively, the Rockets have been one of the better defensive teams in the league. Since the All-Star break, the Rockets have led the league in steals (9.3 per game) and turnover percentage (16.0). With the win, the Rockets are now just three games behind the Nuggets for the No. 2 seed in the Western Conference. But with only six regular season games remaining, they will need to win out and get some help. Their remaining schedule isn’t too difficult with a pair of games against Sacramento and one against the Clippers, Knicks, Suns, and Thunder. But Denver’s remaining schedule is much more challenging with games against the Thunder, Warriors, spurs, and two against the Trail Blazers. Next up for Houston will be the Sacrament Kings at home Saturday night. Denver will face the Oklahoma City Thunder Friday night.